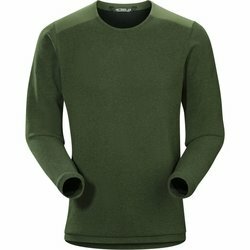 ARC'TERYX Donavan Crew Neck Sweater. A classic crew neck, the Donavan is a casual men's sweater made with the Arc'teryx commitment to craft. The wool-blend double knit has a soft face with a warm knit backer and brings the benefits of four distinct fibers. Recycled wool resists odors and provides warmth, cotton fibers add comfort, polyester aids moisture management, and nylon improves durability. The crew neck delivers casual, versatile style, and the laminated neckline finishes the clean, streamlined Arc'teryx aesthetic.